Home ⎢Where is the O2? I was a guest on a dive boat a few months ago. We had just arrived in Crystal Bay, a notorious diving accident black spot on the outlying Balinese island of Nusa Penida, when our attention was drawn by a burst of frenetic activity next to a neighbouring boat. A wetsuited figure was being manhandled over the side of the boat and laid out on deck. A couple of crewmen hunched over the figure while everyone else on board stood to one side, heads craned in concern. Seeing us approach, one of the crew shouted over and asked if we had oxygen. We did and we handed our big green DAN kit over to them as the boats met bow to bow. They turned and headed off at full speed to the main island of Bali, a good 45 minutes rough ride away. Once the key first aid concerns of monitoring consciousness, airway and breathing have been taken care of, the recommended treatment for suspected decompression illness (DCI) is administration of 100 percent oxygen. The oxygen should be delivered as soon as possible and continuously until there is no more oxygen available or until a diving doctor instructs that it should be interrupted. Therefore, every responsible dive operation, whether boat or land-based, should carry a sufficient supply to allow a diver with suspected DCI to continue breathing oxygen until they arrive at a medical facility with oxygen on tap. Even top dive operations are guilty of failing to plan adequately. For example, liveaboards often carry oxygen on board the mother-boat but not on the small tenders that ferry divers to and from the dive sites. Often this ferrying involves long rides to allow the mother-boat to float free in the deep channel away from the reefs. This means that if a diver blows to the surface, the nearest oxygen is a long way away, and the delay in delivery could make the difference between tragedy and survival. The reassuring visible presence of a big green box on a dive boat is not always a reliable indicator that the dive operation is prepared to deal with an injured diver. 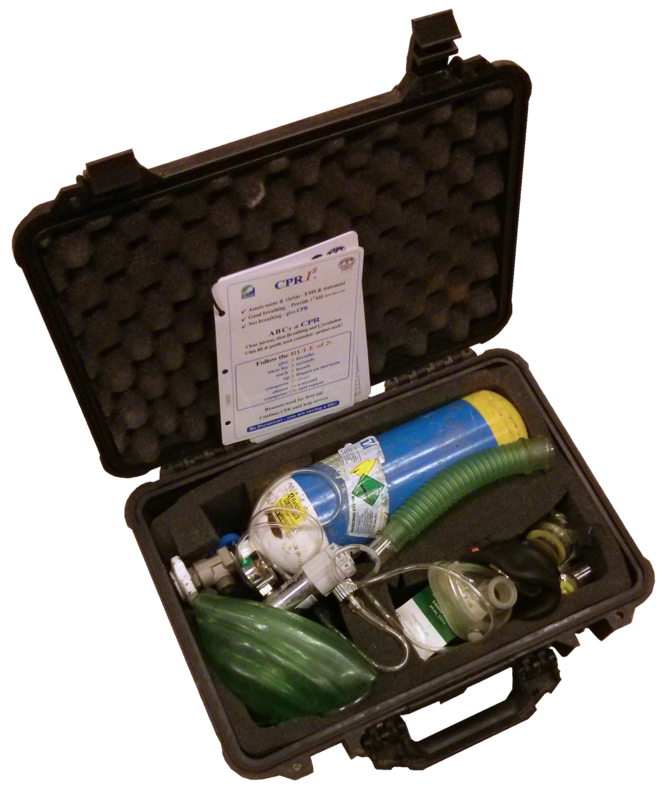 Given that accidents that require immediate delivery of oxygen are thankfully rare, the oxygen kit can sit for a long time without being deployed. Stories abound in the dive industry of boat crews turning to the kit in an emergency and finding that the unforgiving marine environment has caused the rubber hoses to waste away and corroded the cylinder valve to the point of immobility. So, when the question, “Where’s the O2?” is greeted with a vague gesture in the direction of the green box, make a point of asking someone to open it, so you can see what sort of condition it is in and if that cylinder with the reassuring green band around actually has gas in it.